Neil Gaiman's awe-inspiring creativity sculpts uniquely provocative stories. From his multi-layered graphic novels to his illustrious Newberry Medal-winning The Graveyard Book, his imagination knows no limits. Norman Mailer described his Sandman series as a 'comic book for intellectuals'. Meet this master weaver of tales in an exceptional event. Ideal for families and absolutely not to be missed. Scintillating conversation with two phenomenally successful writers who share their thoughts on narrative and the power of storytelling, and give a unique glimpse of their graphic novels.Today Ian Rankin launches his debut graphic novel, a noir thriller starring the iconic private eye John Constantine. 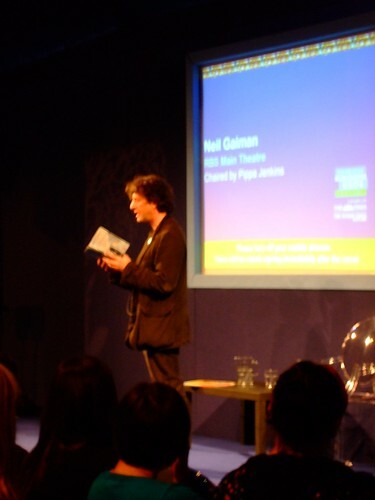 Neil Gaiman's Sandman series was hailed the greatest epic in the history of comic books by the LA Times. Absolutely not to be missed. I like it maybe 63 percent! i expect a ful report off anyone who goes!! I would quite like to go. But can't make up my mind. I think it is because it's a long way, would mean staying up in Scotland, and have promised to stay at home this year and sort out house (and not have a holiday away from home). Plus, I'm not drawn to this as much as I think I should be. And I don't know why? But I am sorely tempted by Edinburgh film festival next week, when I know I can't go as I have work and have already booked my holidays! Strange, my wants. Sometimes I just don't understand myself. I hope all who go have a marvelous time. I would love to go to this, I'm in Birmingham and could fly up. I assume this is an hour talk about his work etc, anyone know if he will be signing ? there are two appearances, one seems more family, so i guess it'll be coraline tinted. the other is split with ian rankin. not sure how that will work. but i guess discussion between the two, comparing techniques or whatever. i've been to a couple of things at the edinburgh book festival before. normally you need a ticket for an event which will be in one of the temporary theatres. the author usually does a reading then takes questions. it usually works out about an hour or so. 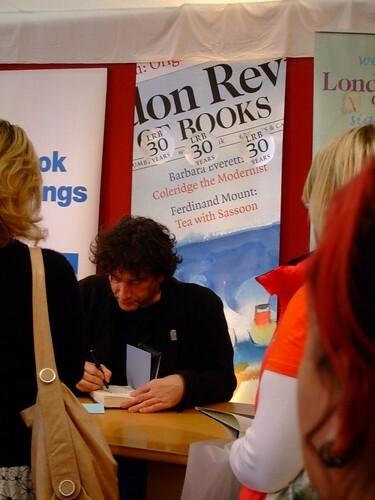 they then move to one of the temporary book stores, where they normally do a signing. also worth noting, the tickets went on sale today. i'd look into getting hotel or whatever. because its during festival and its going to be crazy. we were there, but didn't really get online during that time. i know there were others at the night after, the one with rankin, don't know if they got pictures?